I’ve not written since May. Of course you know this, those of you who follow the Ornery Uterus. Days slipped by and it became easier not to write. A terrible excuse but the most honest I can muster. My post this evening is largely inspired my wonderful, athletic and beautiful sister Stephanie who decided (as if she didn’t have enough to do with three children, a husband and an Ironman race in 2014) that she needed to start a blog. Really? An Ironman? Okay, I guess I can write a blog post. About her starting a blog. Oh geesh. Truth is, I’m damn lazy when it comes to writing. And have I got stuff to say. 1. Eric is CANCER FREE. Yes. You read it right my friend. Cancer free and going strong. He’s kept 35 pounds off his tall frame, been quit smoking for over 7 months, hasn’t touched a soda in 9 months and hasn’t snored a lick since he lost the weight. He rocks in my world. 3. With Birdies underway, we’ve had time to find a doctor we think can get the job done. Dr. Richard Sherbahn from Advanced Fertility Centers of Chicago is our go to guy. We met with him for the first time on Monday, August 19th with mixed reviews on his bedside manner, or lack thereof. This is a numbers guy no doubt about it. He’s science through and through and he prides himself and his practice on producing some of the best results in Illinois and Wisconsin. We figure we can deal with his demeanor if he produces the result we’re looking for. Plus, from what we’ve heard, we’ll be connecting with the nursing staff and other medical personnel on a much more frequent basis. Prior to the meeting with Dr. Sherbahn, I was given an ultrasound to check my uterus and ovaries. I was surprised to learn I had 52 follicles, many more than is expected in my age range. At 38 years old I should be sporting anywhere between 18 and 22. Apparently I’m an overachiever in this department. My ovaries look, at least on paper, as beautiful as an 18 year olds. This will mean Dr. S will retrieve more eggs when he “dips the ladle” in so to speak. Now the quality of those eggs is a different story. But one can assume we will have more to choose from. Yea us! During our discuss with the Dr., Eric asked the very simple and reasonable question, “So why can’t we get pregnant?” Yes. Why can’t we? His sperm was fine. My body seemed to be in working order by all indications. Apparently, Reproductive Endocrinologists are of the thought that something is either “not happening” or something is “preventing” eggs from arriving at the critical meeting point. Well, duh! For example, eggs may be released but the fallopian tubes may not be scooping it up. Essentially the eggs are standing up the sperm. They are never showing up for date night. Bad, bad eggs. Poor Eric. We asked about success rates and really, if I tried to explain it, it would just be more confusing. Eric and I are simply of the belief that when our time comes to participate in this amazing science experiment, that it will all work in our favor. So this brings you up to speed on us and our infertility journey! Our emotions range from excitement to trepidation at times. There is always that fear that we are racing against the clock especially in terms of Eric’s diagnosis. We know that the further he moves out from the cancer removal, the better his prognosis. It still never leaves our mind. Even though this is the most exciting time of our lives, there is something that lingers below the surface which never really lets up. It’s the honest truth. Thank you for following along. More to come next week. I agree. This probably doesn’t sound like the most appetizing dish BUT I implore you to give it a chance. I found it while noodling around on the computer on Monday and thought I would try it since I had a squash all cooked up and ready to go. The key to this concoction is the seasoning. After cutting the squash in two, I sprinkle each side with Emril’s Essence seasoning mix, place them face down in a shallow pan and add some water to the bottom of the pan. I bake it at 350 degrees for about 45 minutes. On Sunday when I made the squash I didn’t know what to do with it so I stored it in the fridge. Fortunately the internet Gods set me up with what I think may just be my favorite all time comfort food dish. I’ve made this recipe twice now in the past four days. This should give some indication about it’s power to woo the taste buds. The first time I made it I used a savory chicken sausage (The recipe originally calls for regular sausage.) and the second time I used crab meat. For general purposes I will give you the sausage recipe. I would love to know what you think! Set the oven to 350 degrees. Cut the spaghetti squash in half, seed the squash and season each side with Emril’s Essence. Put the sides of the squash face down in a pan. Add about a cup of water to the pan. Bake in the oven for 45 minutes or until you can pierce the backs of the squash with a fork fairly easily. 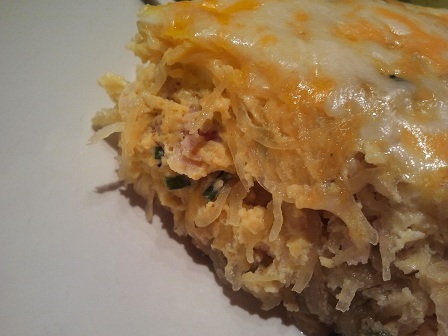 Store the spaghetti squash in an air tight container in the refrigerator if you wish to wait a day before using it. In the meantime remove the sausage from the casing and brown over medium to high heat with a little olive oil. Once browned add the chives and spaghetti squash. Mix until everything is heated through. Beat eggs together with half and half, salt and pepper. Place the squash mixture into a greased casserole dish. Pour the eggs over the top of the squash evenly. Bake in the oven for 45 minutes. The last five minutes sprinkle cheese over the top and bake until bubbly. One note to keep in mind. The original recipe called for fresh sage which I didn’t have on hand. I just eliminated it and it didn’t seem to take away from the recipe. I thought for my second go-round with the dish I would toss caution to the wind and make it with crab. 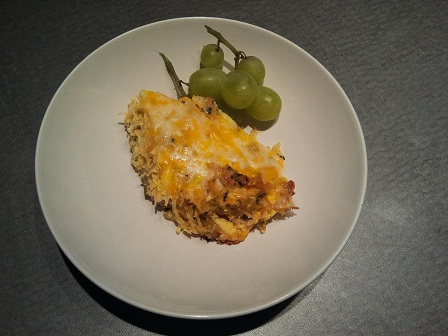 I used the imitation crab for this recipe and it was just as fabulous. Of course real crab would taste much better! What will your twist be? Enjoy! Dad is in town! We’ve been busy catching up, hanging out and generally enjoying the company. It has been a while since he’s been back. This was a much anticipated visit. I’ll be catching everyone up come Sunday. Enjoy the weekend! I’m not a beef eater. (Or liver or lamb or pork for that matter. I also don’t drink milk.) I stick mostly to chicken, turkey and seafood. I’ve been eating this way for almost 13 years and when people ask me why, I tell them I did it for health reasons. Back when I was young and impressionable I attended a health seminar that touted the evils of beef and pork. The conference speakers really pushed a vegetarian lifestyle but I wasn’t that convinced. But they did catch my attention about meat and how it’s processed, etc. I suppose that can be true of any food these days. 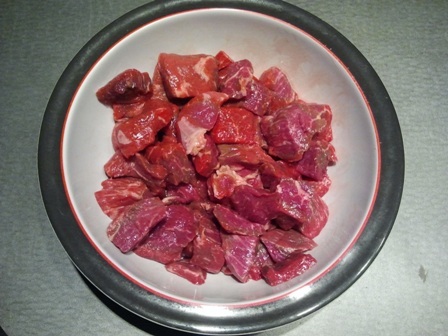 I could go on and on about the food industry but this blog post is about Beef Stew. 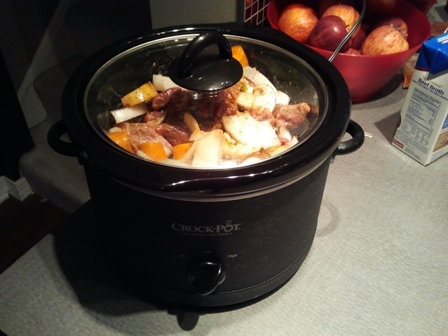 Specifically the Slow Cooker Beef Stew that I was more than happy to make for Eric. After all, he doesn’t get a treat like this very often. Unfortunately for him, unless he puts up a fight, it is chicken most nights. At work, my co-workers and I talk about food as much as we do about business. We love to eat, what can I say. This dish came to me via a recipe that my next door office mate made for her family. She doubled it to feed five and said it worked perfectly. I followed the recipe to the letter and only added a pinch more salt. Eric said he thought something was missing. Since I didn’t try it, I can’t say what that “something” could be. 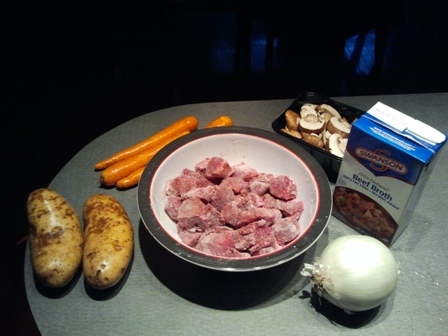 There are a ton of Beef Stew recipes out there. You can always use this one as a base and test different flavors out. Good luck and enjoy! Mix together beef, flour, salt and pepper. Stir to coat meat. Add to crock pot with remaining ingredients. Being infertile is almost like being in limbo. I go on with my life as I know it but I feel stuck in a sense because something is missing. I have the need to nurture something, someone. I don’t know if that time will ever come but there is always the hope it will. A few years ago I was dealing with horrible panic attacks. Today, I don’t have them. I forced myself to slow down and take things one day at a time. This way of operating has been the key to my sanity! During those dark times my Mom sent me a poem that I go back to every now and again. It’s a great poem that is applicable no matter what I am going through. I hope you enjoy it! Oh – and tomorrow’s recipe? 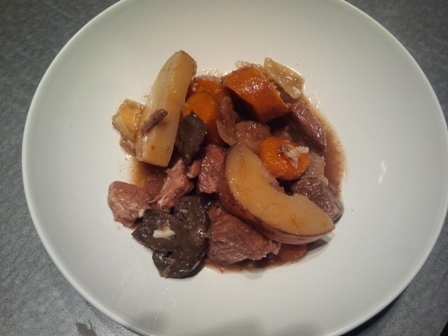 Beef Stew – Slow Cooker Style. I don’t eat beef so this was an interesting one! Stay tuned. . .
I’m really bummed. I found out today from my Doctor that my progesterone levels are not as high as they should be. After eight months of taking Prometrium (a synthetic progesterone). Really? Come on! It’s just one more setback. One more hurdle to have to cross. A $213 hurdle no less. The doc prescribed Crinone 8%, a vaginal progesterone which is supposed to help make the lining of the uterus more lush. Please can I just have a lush uterus? That isn’t such a unmanagable request of someone or some being that supposedly made the world in 7 days. Maybe I need to come up with a prayer for this. OK. I know I sound a little pessimistic. But those of you going through this or have a loved one going through it you know how frustrating it can be. It’s just the little things. This wasn’t what this post was intended for. Infertility, while it plagues me, doesn’t define my life. It is a situation my husband and I are dealing with much to our dismay; but our lives have not stopped because of it. That being said I’d like to set forth some guidelines on how this blog will grow. I want to talk about infertility at times and I also want to share other things with you. Fun things like recipes and stories about my Caribou Coffee fixations and interactions with my three feline pets. I’m an Aunt four times over making me an expert in Aunt type things. I have ideas about event planning (I love a good party) and wine. I love wine. Which means I can tell you all about my Wine Club and the women I sip with every month. I have written some poetry and there is plenty more where that came from. I belong to a Book Club and a Writing Club too. Yes, I know, you may be wondering how I have time to even think about making a baby but trust me, we make time. The rest of the week will be up for grabs. I may feature a cool product or talk about an interesting fundraising event or alert you about a unique volunteer opportunity. I might even have a guest blogger! How fun. I do have to warn you that this Saturday’s post won’t arrive until Sunday afternoon or evening. I’m headed off for a camping trip with three of those lovely nephews I mentioned. The forecast says rain but I’m guessing it won’t dampen anyone’s weekend. Baby dust all around! Until next time. . .